Ships from and sold by HOTcraze. Pop away all day with this bubble wrap keyringBubble wrap is great for protecting packages, but if you are anything like me, the real joy when it comes to bubble wrap is popping each and every bubble. That makes this Keyring probably one of the greatest gifts you could give any avid popper. The Keyring features 8 rubbery little "bubble" buttons which you can pop away with at will. The buttons themselves have a close tactile feel to actual bubble wrap. With surprise sounds along the way, from bongs to even bodily function noises, who knows what you will hear next. If however you want a 60 meter roll of bubble wrap, we can get that for you too! Not even close. Just makes clicks. Buttons are just calculator-type buttons - does not have the tactile feel of bubble wrap. 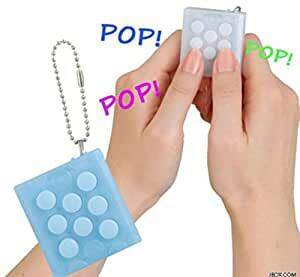 I really love this bubble wrap key chain. I t feels almost like real bubble wrap. It is good to relieve tension. It sounds almost like the real thing and the odd sounds it makes after 100 pushes are great.It is well worth the money you pay for it. I highly recommend it to anyone who likes popping bubble wrap. I work with autistic children and this is the PERFECT fidget for when they have to sit. However, I didn't know that the sound would change. So when one of my clients squeezed it and it let out a scream, it startled us both. For the price I paid, I was expecting something that resembles the bubble wrap feeling more. The popping is very stiff and sometimes you have to press really hard to pop it. It's a gift but very very cool. !